The inner ear or bony labyrinth includes the cochlea for hearing and the vestibular organs for balance. 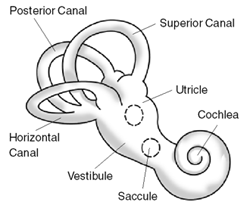 The cochlea is the auditory branch of the inner ear. Its core component is the Organ of Corti, the sensory organ of hearing, which is distributed along the partition separating fluid chambers in the coiled tapered tube of the cochlea. 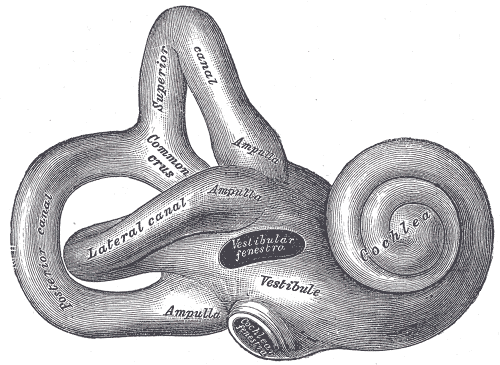 The coiled form of cochlea is unique to mammals. The name is from the Latin for snail, which is from the Greek kokhlias "snail, screw," from kokhlos "spiral shell," in reference to its coiled shape. the scala vestibuli (containing perilymph), which lies superior to the cochlea duct and abuts the oval window. the scala tympani (containing perilymph), which lies inferior to the scala media and terminates at the round window. 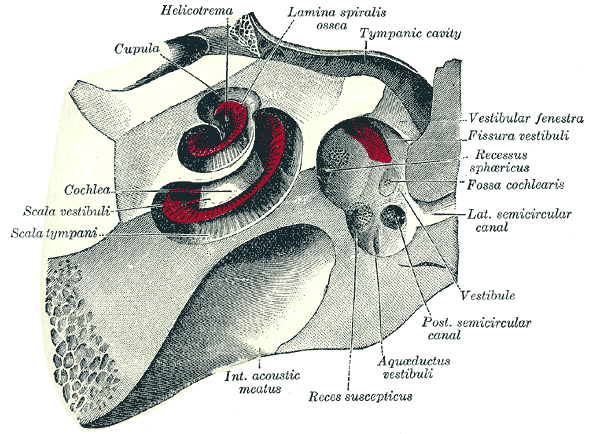 the scala media (containing endolymph), which is the membraneous cochlea duct containing the organ of Corti. Reissner's membrane separates the scala vestibuli from the scala media. 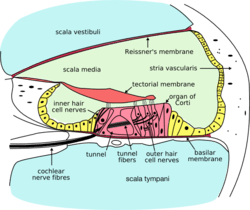 The basilar membrane separates the scala media from the scala tympani. 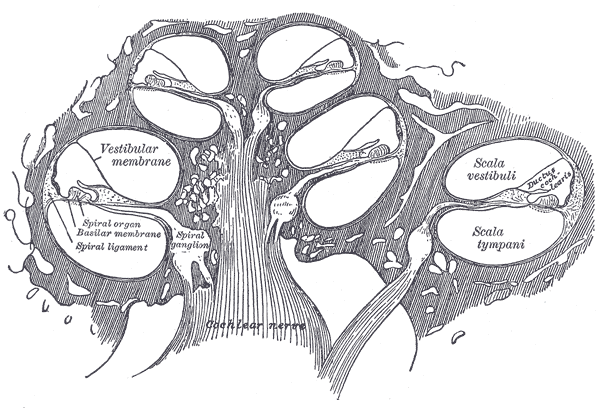 The Organ of Corti is the sensory epithelium, a cellular layer on the basilar membrane, powered by the potential difference between the perilymph and the endolymph. It is lined with hair cells—sensory cells topped with hair-like structures called stereocilia. In brief: the cochlea is filled with a watery liquid, which moves in response to the vibrations coming from the middle ear via the oval window. As the fluid moves, thousand of "hair cells" are set in motion, and convert that motion to electrical signals that are communicated via neurotransmitters to many thousands of nerve cells. These primary auditory neurons transform the signals into electrical impulses known as action potentials, which travel along the auditory nerve to structures in the brainstem for further processing. The hair cells are arranged in four rows in the Organ of Corti along the entire length of the cochlear coil. Three rows consist of outer hair cells (OHCs) and one row consists of inner hair cells (IHCs). The inner hair cells provide the main neural output of the cochlea. The outer hair cells, instead, mainly receive neural input from the brain. Cochlea Facts for Kids. Kiddle Encyclopedia.